With BlackJack comes more than 70 years of boat-building experience. This extensive knowledge of craftmanship has culminated in the Kenner family’s most innovative, exquisite design yet. In a BlackJack, you stand out of the crowd and can get to the fish faster, safer and drier. One of the key characteristics of the BlackJack’s hull design is the “Carolina flare.” This concave design on the front allows the hull to cut into the chop and waves more smoothly, without pounding. Combined with the reverse flare of the hull chines, it serves to turn the spray down and away from the boat, making for a smoother, drier ride. The large lifting strakes on the bottom of the hull help reduce the wetted surface on the hull, meaning a more efficient boat at speed. Aesthetically, the “tumblehome” transom hearkens back to classic wood hulls, as well as the broken shear line of the gunwale. Also, with BlackJack comes excellent customer service that you’d expect from a small builder with a hands-on approach, including a lifetime limited warranty and a friendly voice on the other end of the phone, should an issue arise. The handcrafted quality of our boats, as well as their superior performance and beautiful design, are why so many people choose BlackJack. To learn more, order one of our brochures or visit a nearby dealer to see a BlackJack up close. When you experience the ride and style of a BlackJack in person, you’ll understand why our owners are so passionate and loyal. Seeing is believing. Click here to find a dealer. "As a professional fishing guide, I've owned a number of boats, but the BlackJack 256 is my all-time favorite! The layout allows for great room, so even with four clients onboard no one is crowded. The waters I fish are inland saltwater and flats, and accessing shallow waters is never an issue. Clients and fellow captains are always amazed about the skinny, shallow waters we can access in my BlackJack 256." "BlackJack is truly a great dry ride and takes the rough water better than any other bay boat I have ridden in. The BlackJack gets me to the big fish no matter the weather, keeping me and my customers dry. Their comfort with a smooth ride keeps me focused on what I'm here for: Leading them to the big one." "The ride is fantastic. It's dry and maneuvers in open water and close quarters like no other outboard. Because we fish a lot in North Carolina, its ability to plane quickly and stay on plane at slow speeds gives us an edge crossing wide, sometime choppy expanses of rough water to get to skinny water areas to fish. The layout is terrific. Good dry storage. Nice illuminated live wells. Plenty of rod storage. Easy to move around the boat. The fit and finish is at the top of the class. I get excited every time I run this boat and cannot imagine not having a BlackJack for fishing and just overall fun on the water." "I've been guiding for 25 years in the coastal marshes of south Louisiana. I've been guiding out of BlackJack boats the last 13, and there is not a finer boat on the market. You won't see me guiding out of any other boat!" "BlackJacks are made with backcountry and near-shore fishing in mind. These boats ride better than many larger offshore boats I've owned. They hold the water like they’re on rails, and also float and run extremely shallow for a boat of their stature. I tell people that ride is everything, and you should always take a test ride in less than ideal conditions before purchasing. I always say if you test ride a BlackJack today, you'll be listing your boat tomorrow." BlackJack has taken saltwater bay fishing boats to an entirely new level of performance and style. 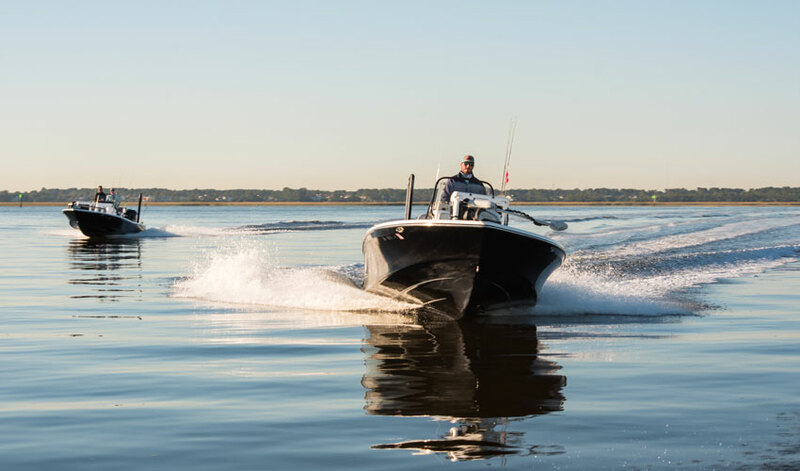 Building on a long family legacy of superior boat design and craftsmanship, BlackJack boats stand out from the crowd because of superior performance, show-stopping design and handcrafted quality.